All of the dogs at Orphans of the Storm® are looking for one thing: a forever home. Some just have more specific requirements than others. Dogs, like people, have preferences. Some dogs would love to have other furry family members; others simply prefer the company of humans. Some dogs want to play all the time; others are couch potatoes. Some dogs prefer women over men; some will befriend anybody. That’s why it’s always a good idea to spend time with a couple of different dogs at the shelter, to make sure that you both like the same things and help ensure that their forever home will be a happy home. 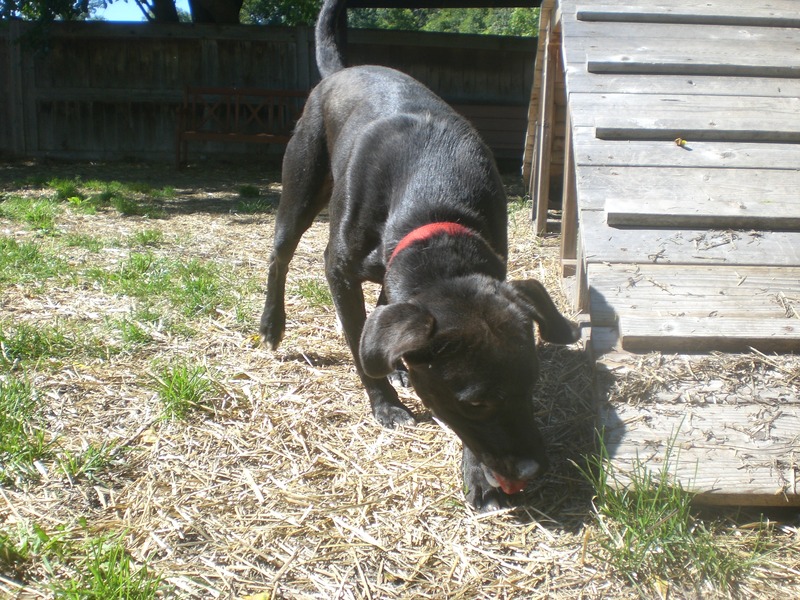 Hachi the one-year-old Mountain Cur mix still has a bit of a puppy look about him–especially that adorable face! As I’ve said before, one-year-olds are still definitely puppies in my book. Hachi is a friendly boy who likes to say hello to any person he comes across, and will do so by giving a happy doggy hug and wagging his tail while he gets a good scratch on the neck. Hachi is also a playful pooch. When the dog in the run next to us was playing fetch, Hachi looked so eager to join in that I found a tennis ball for him too. He hasn’t quite mastered the concept of “fetch,” but with a little practice I’m sure he’ll get there! Hachi would do best in an active household with experienced dog owners who can help give Hachi a purpose, since he was bred to work! If you’re looking for a young dog who is ready to become a faithful companion, come in soon to meet Hachi! Hachi has such interesting fur color(s)! Sally the two-year-old Boxer mix was found as a stray, but she must have had an owner at some point because she is super sweet with everyone she meets and is extremely well-behaved. 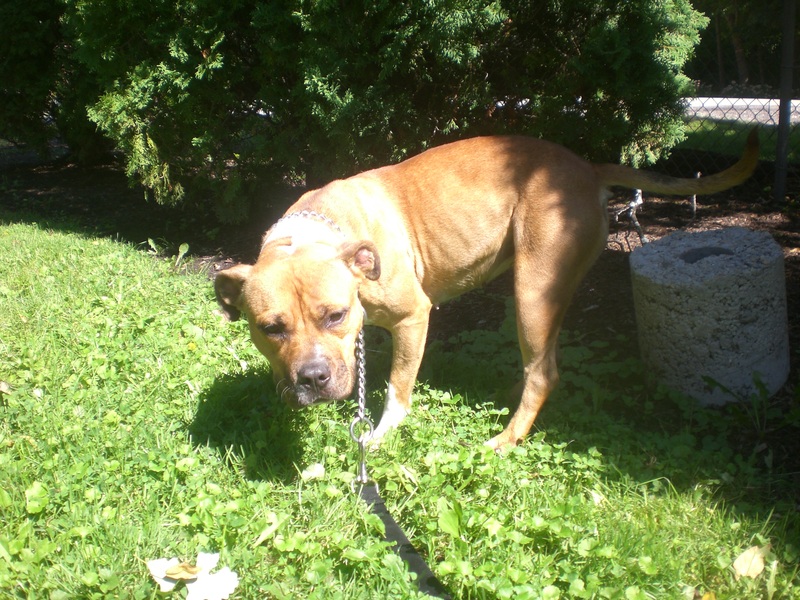 Being mostly muscle, Sally could throw her weight around if she wanted to, but in fact she is a great leash-walking buddy and likes to stay close to her person. Her tail wags almost nonstop. Sally is also super affectionate. She loves to give doggy kisses and would make a great cuddle-buddy. When I sat down on a bench after we had walked around for a bit, she hopped right up next to me and sat there, keeping an eye on things and wagging that tail every time I pet her. The shelter staff and other volunteers think Sally is the sweetest, and I agree! Stop by the shelter soon to say hi to Sally. 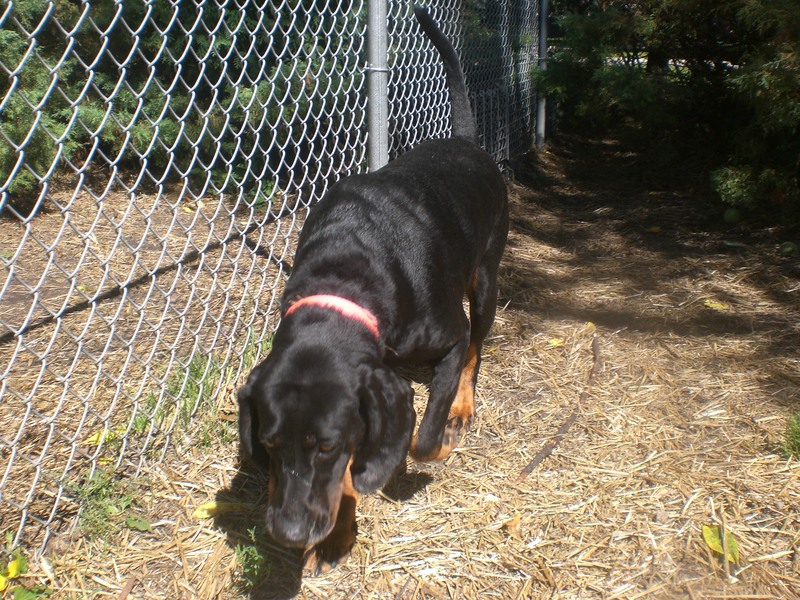 Courage the three-year-old Black and Tan Coonhound mix is a big girl with plenty of energy. 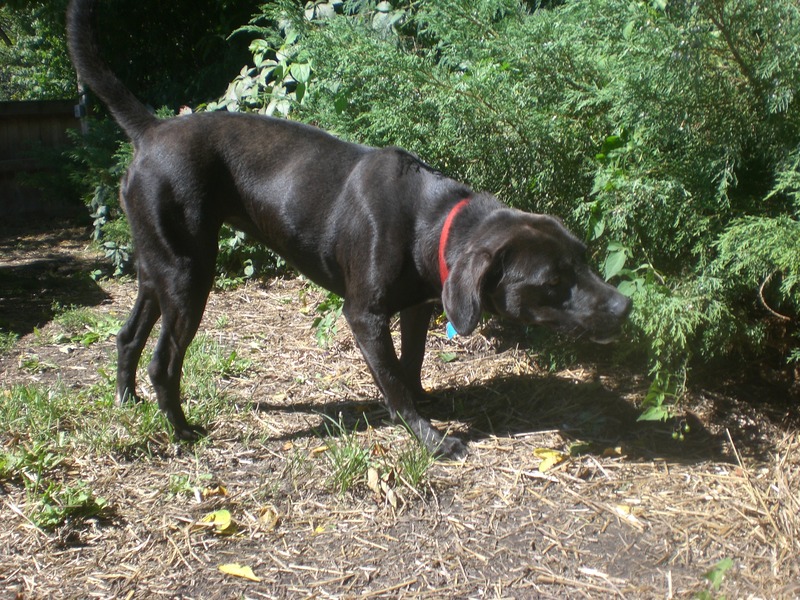 She would have a great time with an owner who likes to go for long walks, which Courage would enjoy both for the exercise and for all the fun smells she could track with her excellent Hound nose. Courage also has that signature Hound howl (though I only heard it once while I was with her). Although she spent most of her time following her nose around the off-leash run and less time socializing, she still enjoyed getting a nice scratch on the back. Courage was plenty polite when giving a hello sniff to the dog on the other side of the fence when we were in the off-leash run, but she would prefer to be the only pet in her new home. 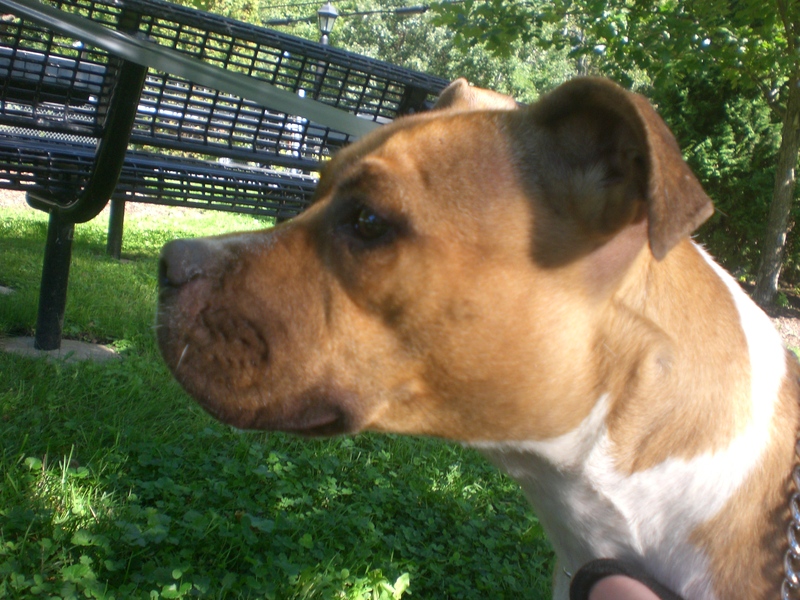 She, like Hachi, would also do best in a home with experienced dog owners. I know there are plenty of Hound-lovers out there who would love to add this beautiful girl to their home. If you think that means you, come by the shelter soon and get to know Courage! Courage is one good-looking pooch! Riya the one-year-old black Labrador Retriever mix has, I’m ashamed to say, been flying under my radar the last few weeks–and boy, have I been missing out on one great dog! Riya excitedly led the way straight to the off-leash run and had a great time romping around. There were three small dogs in the run next to ours, and Riya also enjoyed racing them along the fence, even going into a play-bow a couple of times. Riya, like Hachi, still has plenty of puppy qualities, including being super cute! 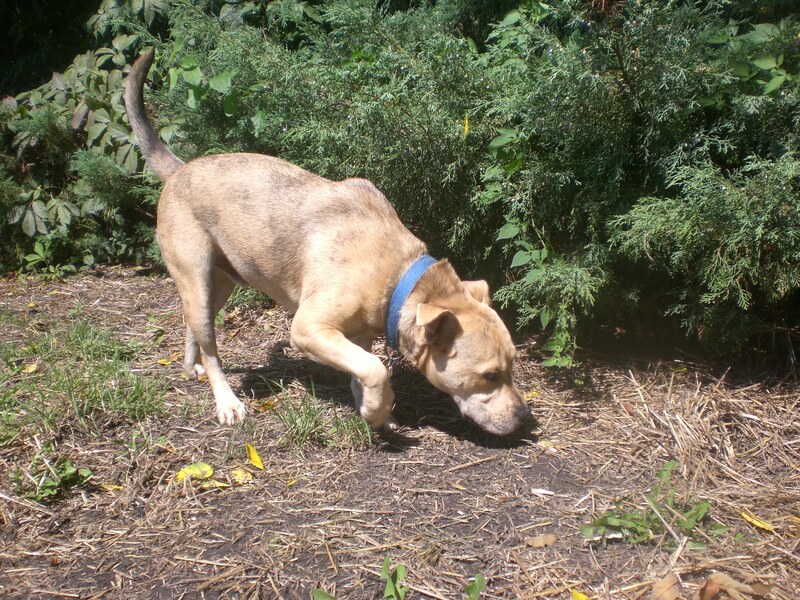 Riya is a friendly girl who greets everybody with a wagging tail. She hopped up on the bench next to me for a quick pat before going off and romping some more. 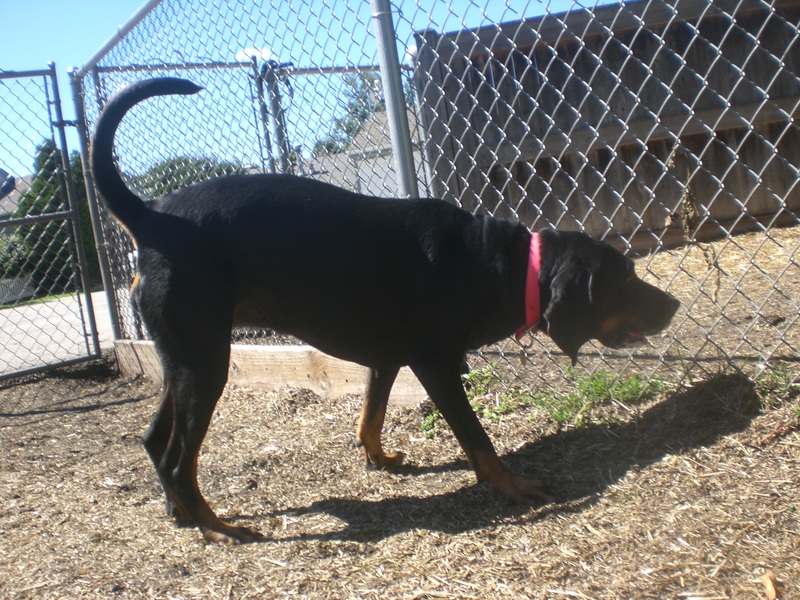 Don’t let Black Dog Syndrome keep a sweetheart like Riya at the shelter for too much longer! 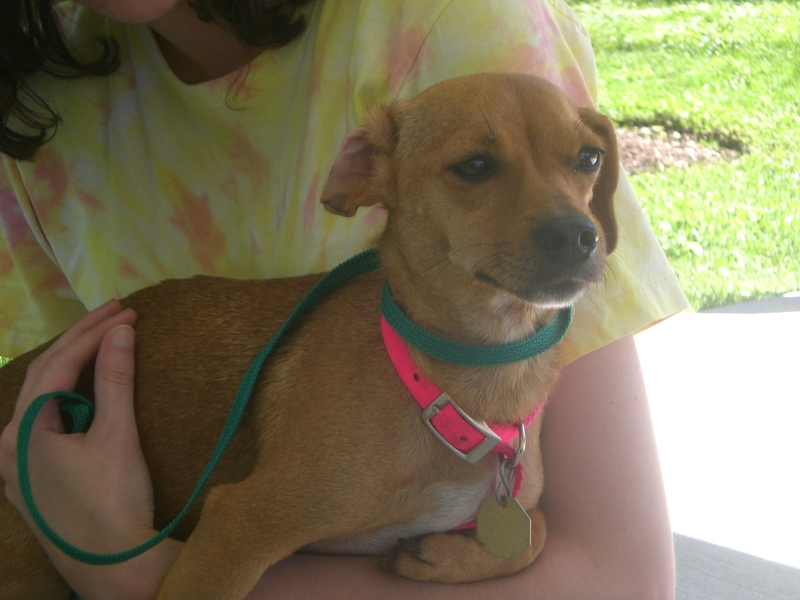 Stop by soon and find out if Riya is the pooch for you. Trixie is one of those dogs who prefers women over men. She climbed into three different women’s laps while I was with her (though I wasn’t near any men at the time so I didn’t get a chance to see how she behaved with them). Trixie is currently sharing her kennel with Gypsy (who jumped right into my lap as soon as I went into their kennel), but she could certainly benefit from some one-on-one love and attention to help bring her out of her shell. She is so sweet and so adorable–she just needs someone to give her a chance. 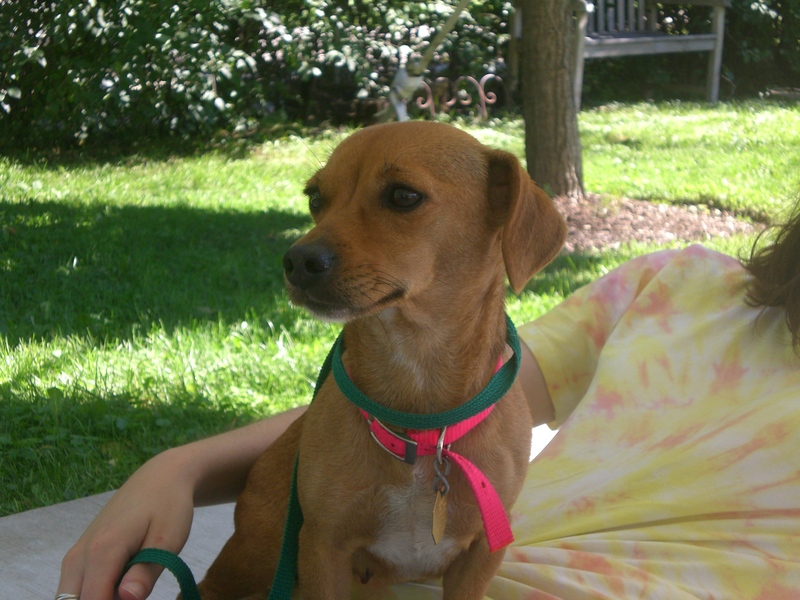 If you’re a lady looking for a new friend, come in soon to meet Trixie! 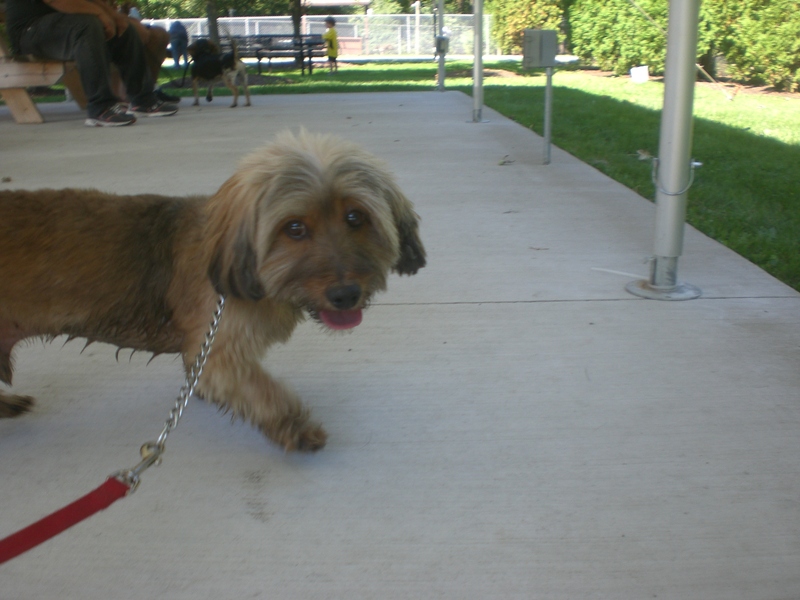 Simon (also known as Harry) the three-year-old Silky Terrier mix has the best head of hair (fur) at the shelter, hands down. It is impossible not to smile when you see him because he is just so fluffy! 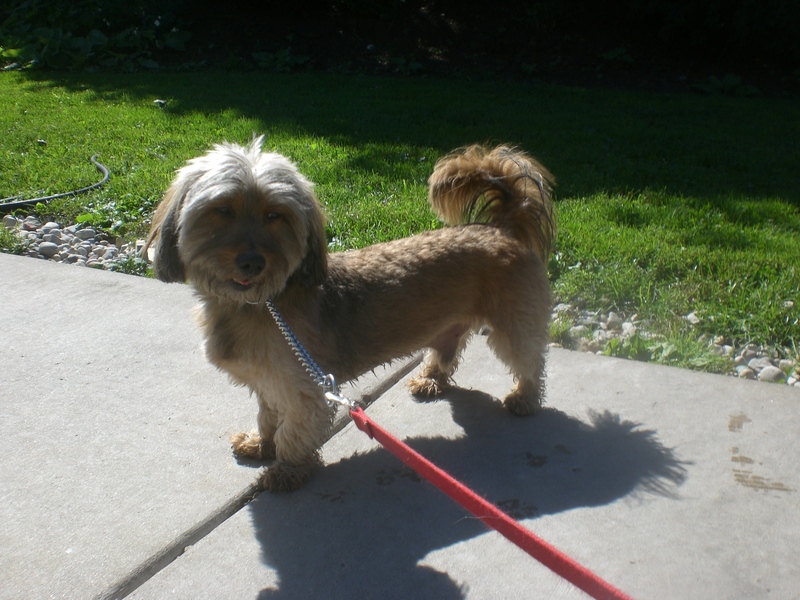 Simon knows he’s a good-looking dog, too–you can tell by the way he struts his stuff when he’s walking on the leash. But Simon doesn’t mind getting a little dirty; he had so much fun rolling around in the grass! And he happily received a belly rub while doing so. Simon, like Trixie, prefers the company of women. And with that independent Terrier personality, he’s another pooch who would do best in a home with someone who has owned dogs before. 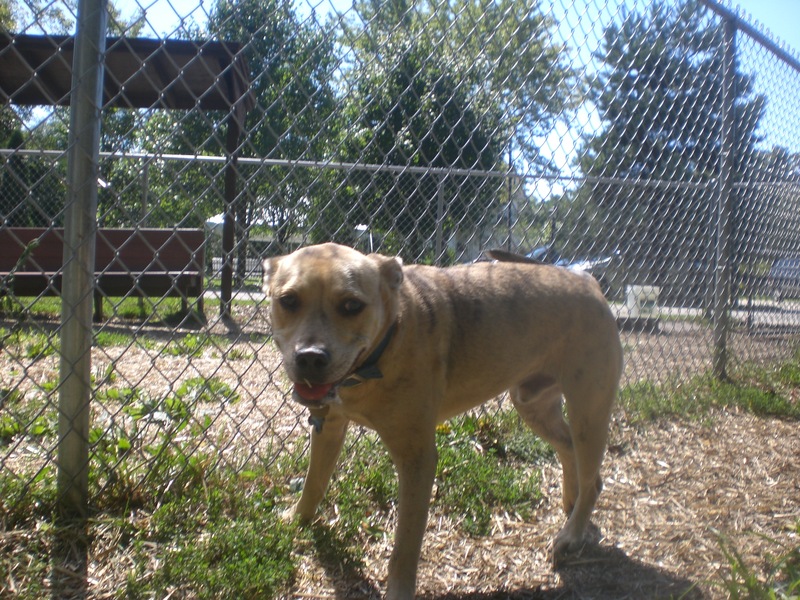 Simon is a fun guy who walks nicely on the leash and will make for a great snuggler. Calling all the single ladies: If you’re looking for a new, handsome guy in your life, look no further than Simon! I also saw my furry friends Bueller, Ebbie, Mr. Big (who is doing so much better with his leash-walking now! ), Screamer (who is still a total lapdog), and Tom-Tom. Were you wondering what happened to the annual Orphans of the Storm® Pooch Parade this summer? Never fear! It has been moved to Saturday, October 18 and is Halloween-themed! You and your pooch can come in costume and help raise both awareness and funds for the shelter. For more information, visit https://www.stayclassy.org/deerfield/events/happy-halloween-pooch-parade-2014/e37134. Posted by Meet the Pooches on September 11, 2014 in Dog Profiles and tagged adoption, animal shelter, animals, Black and Tan Coonhound, Boxer, Chihuahua, Dachshund, dogs, Labrador Retriever, Mountain Cur, Orphans of the Storm, pets, Silky Terrier. Hi Delores, thanks for reading! The best way to learn more information about Simon and the adoption process is to call the shelter directly at 847-945-0235. I hope it works out!